Ashley Greene to Attend Avon’s Global Voices for Change Awards on November 2nd. Global music icons including Fergie and Natasha Bedingfield will judge the performances of the Avon Voices top ten finalists. An unprecedented singing talent search, Avon Voices started in December 2010, and attracted contestants in 60 countries to compete to become one of the Avon Voices winners. Read more about day 1 event here. The Avon Foundation will honor international organizations for their life-saving work in accelerating breast cancer research and access to care and the crusade to end violence against women. Additionally, the Avon Voices talent search will conclude with the announcement of the two winners – one an Avon Representative – who will be chosen from among the top ten finalists, based on a combination of their live performances at the Hard Rock Café on November 1, and the 2.5 million votes received from around the world. The evening will also feature performances by the Avon Voices finalists. Avon Chairman & CEO Andrea Jung, and the Avon Voices Judges, including: Six-time Grammy award winner Fergie, Grammy nominated singer/songwriter Natasha Bedingfield, legendary song writer Diane Warren, Australian artist of the decade Delta Goodrem, Filipina singer and actress Lea Salonga, Brazil’s biggest pop star Ivete Sangalo, Russian sensation Valeriya, Grammy award wining artist David Pack, American music artist Sheila E, Colombian singing star, Maia. Ashley Greene, the Ambassador for mark, a division of Avon Products, Inc., will also appear. Ashley attended the ‘Twilight Saga – Breaking Dawn Part I’ red carpet and fan event in Stockholm, Sweden as part of the European promotional tour with co-star Robert Pattinson (October 28). Keep checking back for more updates! Video: New ‘Breaking Dawn’ TV Spot! Check out this new Twilight Saga – Breaking Dawn Part 1 TV spot featuring few new scenes! Ashley and co-star Robert Pattinson arrived in their next and last stop of the ‘Breaking Dawn’ European promotional tour, Stockholm Sweden, and were on hand for a press conference this morning October 28, 2011. Ashley attended the ‘Twilight Saga – Breaking Dawn Part I’ red carpet and fan event in Brussels, Belgium as part of the European promotional tour with co-star Robert Pattinson (October 26). Keep checking back for more updates! More festivals for Ashley Greene’s ‘Butter’! HAWAII INTERNATIONAL FILM FESTIVAL – Oct 22, 2011 Just added! AUSTIN FILM FESTIVAL – Oct 20, 2011 Just added! AFI FEST (LOS ANGELES) – Nov 6, 2011 Just added! VIRGINIA FILM FESTIVAL – Nov 6, 2011 Just added! LONE STAR – Nov 12, 2011 Just added! DENVER FILM FESTIVAL – Nov 13, 2011 Just added! We now have some of Ashley’s photos for BlackBook Magazine (November 2011) in MQ! Check them out below, plus the Magazine Scans here for even more pics! Ashley attended the ‘Twilight Saga – Breaking Dawn Part I’ red carpet and fan event in Paris, France as part of the European promotional tour with co-star Robert Pattinson (October 23). Keep checking back, we’ll be adding more updates as they come! 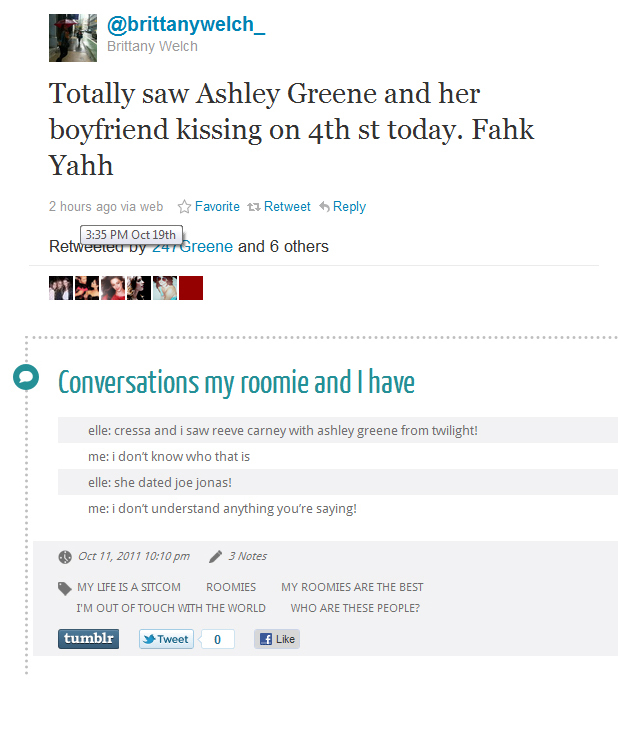 “Took the train from Germany to Paris with my friend yesterday to go to the Breaking Dawn event on Sunday. As we didn’t get tickets, we hoped for a good spot at the red carpet but there is still no confirmation if they will even give autographs there. After some sightseeing we walked past a street and noticed five girls at the back entrance of an hotel. Without knowing who they were waiting for (Rihanna was in town as well), we stood on the other side of the road and waited – for six hours. Some time in the evening they closed the garage of the hotel so Rob and Ashley (a girl told us she is 100% positive that they are staying at that hotel) could get into the cars unnoticed to go out for dinner. As we were just eight people they actually came out, took photos with us and personalized our autographs. Rob was handsome as ever (the bear on his face is gone) and Ashley was just as beautiful and charming. Both of them were really nice and funny though they must have been exhausted. Rob even had to borrow my pen to sign everyones autographs and he looked for me and my friend later to give the pen back to us – such a considerate young man. More photos from Ashley’s upcoming cover-shoot for Esquire Magazine! They are tagged though, unfortunately. If you find or have the originals and would like to share them untagged let us know here! Ashley is ready to kick off the Twilight European leg tour with co-star Rob Pattinson and was spotted arriving at Roissy Charles de Gaulles Airport in Paris, France this morning (October 22). Ashley will attend a fan event there, tomorrow Sunday (Oct 23), and do press on Monday. Read more about her expected schedule here, and check out the new candids under the cut! Thanks to kroqjock, we now have the scans of Ashley in the November issue of BlackBook Magazine! Check out her interview plus the new photo-shoot under the cut. She looks flawless! Ashley Greene Guest-Edits Allure Magazine! Jennifer Scott asked, “Do you have any tips/techniques that I can use to make my fine, flat hair have more volume and oommpphh like yours?” Dry shampoo is my secret weapon! Spray it on dry hair, at the roots, for instant volume. Also, after curling your hair, flip your head over and mist with a flexible-hold hair spray. Rachel Payment asked, “Hi, Ashley. How do you find time to keep in shape? Do you hit the gym, take classes, or just work fitness into your daily routine? Either way, you look great without looking famished!” Thanks! I do try to live an acti…ve, healthy lifestyle. I hit the gym a few times a week. I constantly look for opportunities to switch it up and keep it fun though! Find something to make exercise enjoyable for you, like a great playlist, an outdoor activity, or working out with a friend! Denise Smith asked, “Which of your Twilight castmates do you feel you will always keep in close contact with?” Kellan and I were best friends before the films, and getting to experience the amazing whirlwind that is Twilight together made us even closer. After five films together, the entire cast and crew has really become an extended family, so I hope we all keep in touch. Fans in Sweden brave the cold for a chance to meet Ashley and Robert Pattinson in Stockholm next Friday (October 28) [BreakingDawnMovie]. Ashley will be in Paris this Sunday (October 23)! Browse our ‘Breaking Dawn’ tag for info on her US and European Twi-tour! ‘Butter‘ has also been added to the lineups of Savannah Film Festival [scad.edu], and St. Louis International Film Festival (Nov. 10-20) [stltoday]. It was previously announced that it will screen at the upcoming Chicago Film Festival, Philadelphia Film Festival, Fort Lauderdale International Film Festival and Napa Valley Film Festival. Check out our ‘Butter’ tag for more info on the screenings or refer to the festivals’ official websites (Google is your friend!). ‘Butter’ has already played the Telluride Film Festival, Toronto International Film Festival, Austin Film Festival and Hamptons Film Festival in the last 6 weeks and generated mostly favorable response! UHQ Full scans of Ashley in Allure Magazine (November 2011) were added here. Make sure to check out Allure’s ‘Her Style Timeline’ for extended quotes form her interview! ICYMI: First still of Ashley in ‘Butter’ | Ashley the new face for DKNY and DKNY Jeans! 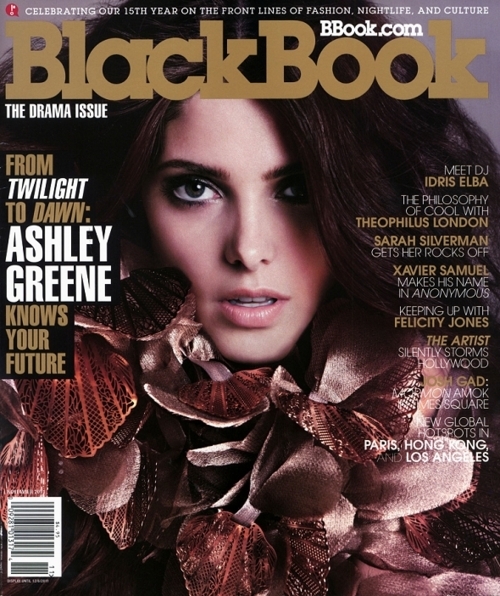 | Ashley covers BlackBook Magazine (November 2011) | New video with new Breaking Dawn Footage + Ashley and Cast interviews. First Still of Ashley Greene in ‘Butter’! Check out more stills and the first clip from the film, in case you missed it, here and here (respectively). The film is said to be heading for an early 2012 wide release. Cast and musical performance schedule subject to change. Ashley Greene says her brother is terrified of being seen with her – in case he mistakenly gets romantically linked with her. The ‘Twilight’ beauty says that since her split with Joe Jonas, virtually every man she is seen with gets called a new love interest. “I’m not an actress – I’m a professional dater! I’m dating everyone!” she laughed. “My brother won’t even walk outside a restaurant with me. He’s like, ‘I do not want to be romantically linked to you’.” She clarifies: “I’m not dating anyone.” Greene, who insists in her BlackBook magazine interview that she is “not perfect, I have flaws“, also talked about growing up with a Marine as a dad – and her huge list of injuries as a sporty kid. Video: New ‘Breaking Dawn’ Wedding Footage & Cast Interviews! Check out this new video from Yahoo! Movies featuring unseen footage from the much anticipated ‘Breaking Dawn’ wedding scene plus interviews with Ashley and the cast! Ashley Greene Inks Deal with DKNY and DKNY Jeans! Ashley is the new face for DKNY and DKNY Jeans! DKNY announced today, October 19, via their official Twitter and tumblr page that Ashley has inked an exclusive one year deal to be the brand ambassador! She will be photographed by Inez van Lamsweerde and Vinoodh Matadin to appear in the brand’s global ad campaigns for Spring 2012. Ashley follows in the footsteps of Rachel Bilson, Hilary Duff, Alexa Chung, Anja Rubik, Harley Viera Newton, and Leigh Lezark who have been DKNY faces in the past years. Great partnership considering she’s always been a fan! Cannot wait to see her ads for the brand!